Jupiter's moon Ganymede. A new study shows that the electromagnetic waves near Ganymede are extremely powerful. There are some wild waves flowing around Jupiter's largest moon, but don't break out your surfboard just yet, because these powerful waves are made of plasma. Around planets like Earth, there is plasma, one of the four types of matter. Plasma is created when an ionized gas becomes electrically conductive and can be shaped and controlled by electric and magnetic fields, which also exist around Earth. Earth's plasmasphere is a region that contains dense, cold plasma. When Earth's electric and magnetic fields fluctuate, they push and pull at the particles in this plasma, creating waves. Just like a strong wind can create waves in a body of water, fluctuating electric and magnetic fields can cause chorus waves in the plasma near objects like Earth. Different types of plasma waves can be found in different regions around planets like Earth. In a new study, a team of scientists led by Yuri Shpritsof the German Research Centre for Geosciences and the University of Potsdamexplored the chorus waves around other planets in our solar system, and even some of their moons. 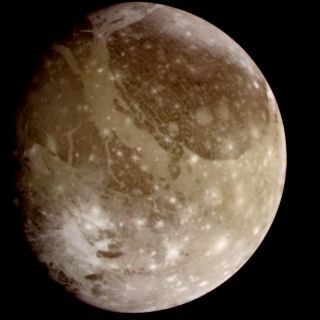 They found that the chorus waves around Jupiter's moon Ganymede are a million times more powerful than the average around the planets they studied. The team also explored powerful chorus waves near Jupiter's moon Europa, according to a statement. "It's a really surprising and puzzling observation showing that a moon with a magnetic field can create such a tremendous intensification in the power of waves," Shprits said in the statement. "Chorus waves have been detected in space around the Earth, but they are nowhere near as strong as the waves at Jupiter," Richard Horne, a researcher at the British Antarctic Survey and a co-author on the study, said in the statement. "Even if [a] small portion of these waves escapes the immediate vicinity of Ganymede, they will be capable of accelerating particles to very high energies and ultimately producing very fast electrons inside Jupiter's magnetic field." Understanding these waves can significantly help scientists to understand how particles are accelerated and lost in space, according to the study. The impact of chorus waves on Earth can be seen easily, depending where you are, because they are responsible for the famous northern (and southern) lights, the auroras predominantly seen from the Arctic and Antarctic. Studying these plasma waves could be especially useful for maintaining and protecting spacecraft, as chorus waves aren't just responsible for the northern lights, they also help to create high-energy "killer'" electrons around Earth, researchers said in the statement. These killer electrons can damage spacecraft, and researchers are concerned about what effect they may have on spacecraft traveling to Jupiter. This work was detailed yesterday (Aug. 7) in the journal Nature Communications.